The centenary of the First World War years has set many of us exploring the role our relatives played during those years of conflict. Although access to online digitised records has ma de the search easier, not all our questions are answered. If your WW1 ancestors are proving to be a challenge, come along to Bishopthorpe Library on Wednesday, 17th and Saturday, 20th June, when Ken and Linda Haywood will be holding a First World War Family History Help-Desk Event. Ken and Linda, who have been helping researchers for many years, will bring several finding aids and sources of information with them. In particular, they will have the City of York World War 1 Card Index. This invaluable Index lists the details of more than 10,000 men and women from the city who served with the Forces. 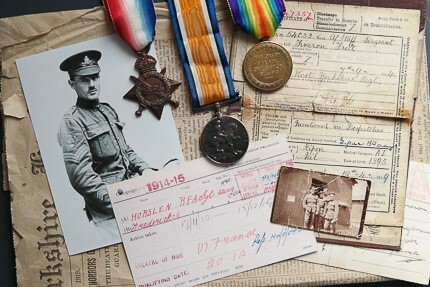 The research assistance applies both to those who survived the war and those who did not. Bring your details and Ken and Linda will do their best to help you find what Great/Gran or Great/Grandad did in the war. To make your search even more enjoyable, coffee and home-made cakes will be provided by the Library at a small charge. 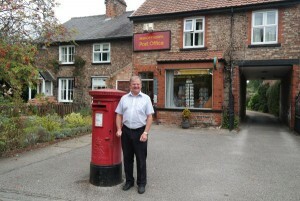 When Glynn Drummond announced he was going to retire as Bishopthorpe Postmaster, a tremor passed through the village. No one wished to lose the Post Office. However, as we now know, the P.O. has re-opened at the newsagent in Sim Balk Lane, and a collective sigh of relief was heard for miles. It would, indeed, have been a great disappointment if the Post Office had closed down, bearing in mind that a postal service has operated in Bishopthorpe for 171 years. On 6th January 1844, just four years after the introduction of the Penny Post, the Postmaster General decided to establish an “official Post” for the residents of Bishopthorpe and surrounding area. A foot messenger set out from York Post Office each day at 6.00 a.m. delivering letters to the receivers of mail at the Mount, Dringhouses, Middlethorpe, Bishopthorpe, Acaster Malbis and across the ferry to Naburn. He returned to York with the day’s collection by 6.00 p.m. having reached Bishopthorpe at 4.45 p.m.
During the first two years, deliveries were also made on Sundays, much to the disapproval of certain inhabitants. It was not stated if Archbishop Harcourt’s influence prevailed but, following a communication sent to the Postmaster General, the Sunday post was withdrawn. The service was not re-instated until 1912. The foot messenger was paid 14 shillings a week and the receivers, £4.00 per year. Letters were not delivered to individual properties, only to the receiving offices. These collecting points were located in existing businesses such as blacksmiths’ and wheelwrights’ workshops. The proprietors looked on this as a lucrative side line – not for the small P.O. allowance they were paid, but for the extra custom it brought through their doors when villagers called in to post or collect their letters. 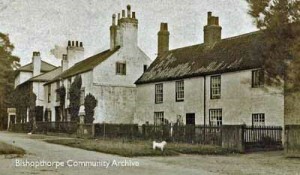 The building on the right of this photograph is now known as Chestnut Cottage, but it used to be divided into two separate buildings. The left-hand side was the Post Office for at least fifty years until 1899. The telegraph wire can just be seen jutting from the chimney stack. Unfortunately, the identity of Bishopthorpe’s first receiver is not known but, by the time the1851 Census was taken, Mrs. Jane Dobson, a widow, received mail at the house we now know as Chestnut Cottage in Chantry Lane. Mrs. Dobson died in 1865 and her successor was another widow; Mrs. Ellen Hawkridge, who supported her family by dressmaking. She lived near The Woodman but later moved into Chestnut Cottage. Mrs. Hawkridge served the community for more than thirty years but not without trial and tribulation. During that time she coped with the new telegraph service which was connected to her premises in 1889. Five years later a burglar smashed his way into the office stealing just £2 because Mrs. Hawkridge had already taken the week’s proceeds into York. When she retired in 1899, Archbishop Maclagan unsuccessfully appealed to the Postmaster General to provide her with a pension. However, sub-postmasters/mistresses were not considered to be full-time employees and therefore not eligible to receive a pension. There were no exceptions. Gertrude Johnson set up the next sub-post office in the extension at the side of her brother’s house in Main Street [now no. 50, next door but one to The Ebor]. In her time, the business grew more complex: she dealt with insurance, savings, money orders, an express delivery service and, from 1908, the state pension. Her sister, Evelyn, served as the telegraph clerk which was just as well; in 1901, the Postmaster General offered the Parish Council the use of the telegraph at night, “in cases of urgent necessity.” The Council accepted the proposal at a charge of 10 shillings [50p]. Fortunately, all this extra work eventually earned Miss Johnson a half-day’s holiday on Saturdays, but not until eight years later. In the 1920s, Joseph Bulmer merged the Post Office with his grocer’s shop in Main Street, eventually moving into the property we are familiar with, next door to The Marcia (see Glynn, above). After many decades, the Post Office has moved again where we hope it will continue to serve the people of Bishopthorpe for a long time to come. Post Office Archives: Post Office Minutes: Post 35. 1851 Census: HO107/2354/ f350, p2. Yorkshire Gazette: 5 May 1894, p7. Glynn Drummond photographed in front of Bishopthorpe Post Office, Main Street, which closed in February 2015. 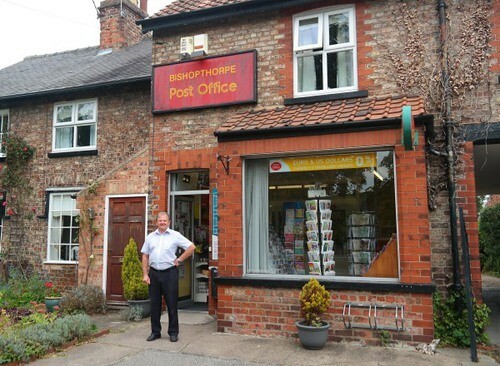 It would, indeed, have been a great disappointment if the Post Office had closed down, bearing in mind that a postal service has operated in Bishopthorpe for 171 years. To read about the history of our local postal service, see the article in Local History.